Click to read our entire coverage of the Siberian Yeti. 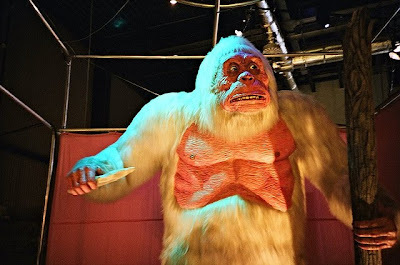 On October 6th through 8th, Cryptozoological researchers from Russia, the US and China will attend the meetings to discuss the Yeti's biology and habits. Below is an excerpt From a Monsters and Critics post. Moscow - Scientists from seven countries will gather to discuss the possible existence of the fabled Yeti and the creature's biology and habits, Russian officials in the central Siberian town Tashtagol told dpa. Cryptozoological researchers from Russia, the US and China will attend the meetings scheduled from October 6 to 8 in Kemerovo province town some 3,200 kilometres east of Moscow. The experts will present 'surprising insights, and unique photographs and audio recordings' about the creature, a Kemerovo spokesman said. Local game wardens have cited evidence allegedly obtained by a motion-triggered camera in a cave some 80 kilometres away from Tashtagol as possible proof of the existence of an unknown hominid in the area. Last year, the Kemerovo regional administration issued a 'Yeti-warning' calling on local residents to be on the look out for a hairy bipedal creature which might come into the open looking for food because of forest fires burning in the area at the time. The most recent Yeti expedition in the Kemerovo region took place in September. Back in September, the great blog Bigfoot Evidence posted a few intriguing details of the event. We have a brief excerpt below. An International Scientific Conference on Hominology will be held in Tashtagol city, Kemerovo Oblast, Russian Federation from October 6 to October 9, 2011.Many local residents in Tashtagol regions believe that there are still many Yetis or Almas or Bigfoot exist and live around the regions of Tashtagol. Once there was a case when the governor of Kemerovo region Aman Tuleev offered cash prize to whoever catches the Yeti. The conference will be attended by the famous scientists; biologists, anthropologists, geneticists, hominologists, bioinformatics from the United States, Canada, Sweden, China, Mongolia and Russia. This time the scientists will not only gather and discuss about this issue, but they will also plan to travel to the regions where Yetis thought to be living. R.Barsbold, a paleontologist and geologist at the Geological Institute, Mongolian Academy of Sciences, will participate at the conference representing Mongolia. He is the son of the famous Mongolian writer, scientist and academician B.Rinchen.